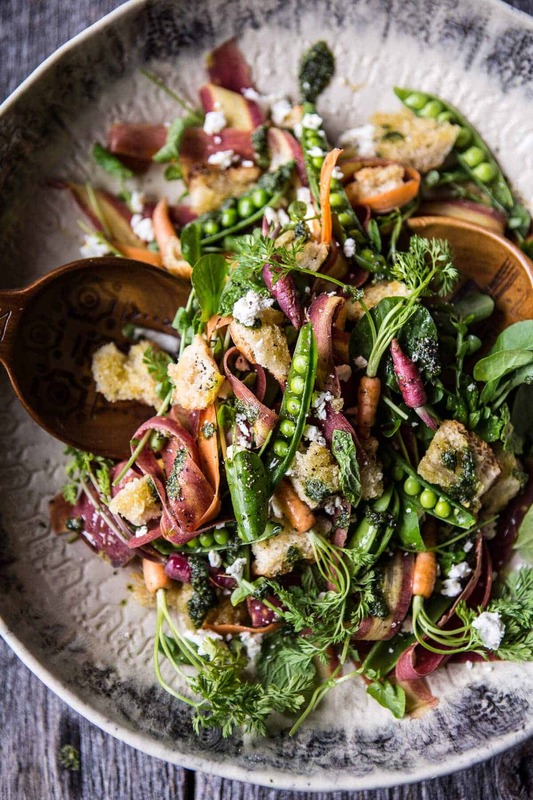 Doesn’t this salad just seem like something the Easter bunny would love? I mean, I know the Easter bunny may not be real 🙁 But if he was, I think he’d devour this salad. So here’s the deal, you all know I am just not into boring salads. Like if I am going to eat a salad, it’s going to be full of goodness, cheese and carbs. Always, always cheese and carbs. No other way to do a salad in my opinion. So while today’s salad is still light, healthy and fresh, it also contains my three must haves: veggies, carbs and cheese. 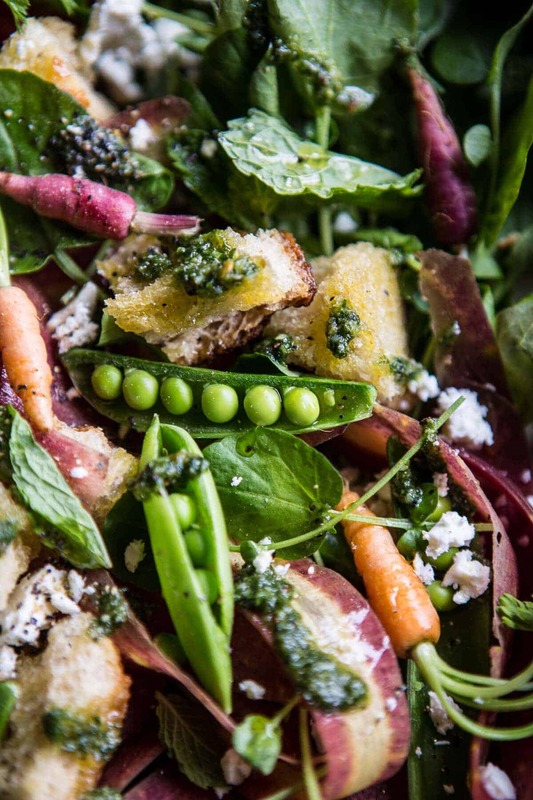 This Spring Pea and Carrot Salad has crunchy veggies (like carrots, snap peas and watercress), toasted ciabatta croutons and feta cheese (and some parmesan in the pesto!). It’s also tossed with one of my favorite things, pesto. But instead of just throwing out those pretty carrot greens, I turned them into my pesto. May sound kind of odd, but you guys I promise it’s actually really good, plus you don’t waste any food. Soo, I am sure you’ve noticed, but the theme for this week is all things Easter. 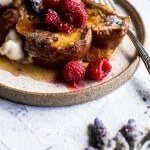 I started off with a main course of fun Greek Lamb Skewers, moved on to Easter brunch with a KILLER cream cheese stuffed raspberry French toast and now it’s time for some sides. Typically my family doesn’t get it together early enough for an Easter Brunch or lunch, usually it’s an Easter dinner. For the Easters we have spent in Florida, my grandma will usually cook a ham with plenty of side salads, potatoes and dessert. Always dessert! Nonnie makes a really cute bunny cake that someday she needs to teach me how to make! OH and plenty of cheese too! My grandma makes some killer cheeseboards. She taught me everything I know about how to create a stunning cheeseboard! Anyway, my point in all this rambling is that I think this is the first year my family and I will be here in Colorado together for Easter. No Florida (enter major sad face here 🙁 ), no snowboard trips, and no work trips. There were a couple of years when I was home, but my family was gone with Red for some snowboard competition or something like that. This year though, more than half the family will be here. Even Kai gets in that day for his spring break. The missing members of the family will be Creighton (Cleveland), Red (Snowboard Mag photo shoot at Big Bear) and Brendan…although you never know with Bren, he could show up at any moment! FUN FACT: pretty sure mom has ordered some Malley’s chocolate (aka the bestest chocolate ever) to MAKE our baskets super delish. YEAHH! ? ? Easter dinner is all on me this year! Not that, that’s a big deal or anything…my family is so low-key it’s insane. Like I said, main course for dinner is covered, Saturday brunch is covered (Easter celebration for Red who has to leave on Sunday) drinks are sooo covered, and now we just need a side…or two…check back tomorrow for that…and one more chocolatey dessert to go along with this pretty cake and this carroty cheesecake. I know, I know, it’s kind of a lot of food, but that’s the way I like it! Crossing my fingers that my mouth is all back to normal by Sunday. It’s still pretty sore, but getting less sore with each day! Alright, but this salad. It’s so simple, but soo good. Perfect for a light brunch salad or a light dinner salad. You can prepare it in advance for easy entertaining, and I mean, come on, it’s pretty dang gorgeous too! That’s always a plus in my book. One important thing though. Don’t skip out on those homemade croutons. Not only are they so easy to make, but um, they are DELICIOUS. Like I said, a good salad always has some carbs and some cheese, never just greens. Question: What are you guys doing this Sunday for Easter?!? 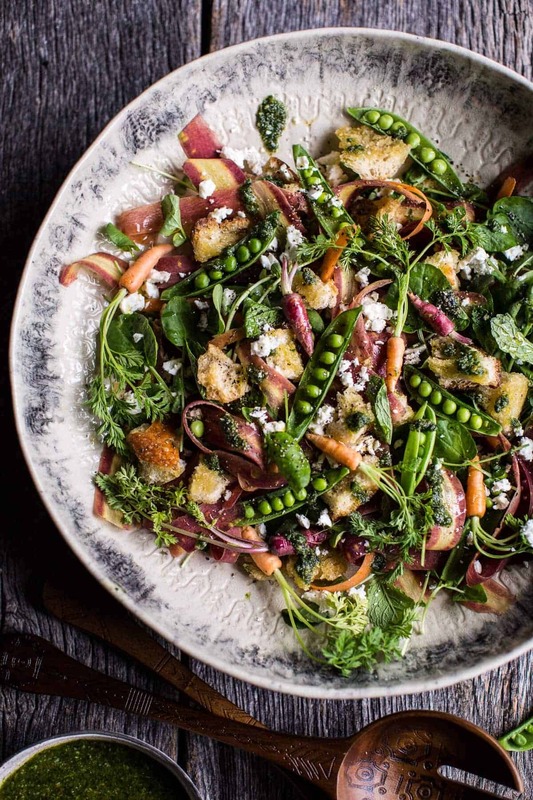 Doesn't this salad just seem like something the Easter bunny would love? In the bowl of a food processor or high powered blender, combine the carrot top greens, basil and pine nuts. Pulse until finely chopped. With the machine still running, drizzle in the olive oil. Add the parmesan, a pinch of crushed red pepper flakes and season with salt. Taste and add more salt if needed. Pour into a glass jar and keep in the fridge until ready to serve. On a large baking sheet, toss the torn bread with the olive oil, garlic, salt and pepper until all the bread is evenly and well coated. Place in the oven and bake for 10-15 minutes, tossing half way through until the bread is golden and toasted. 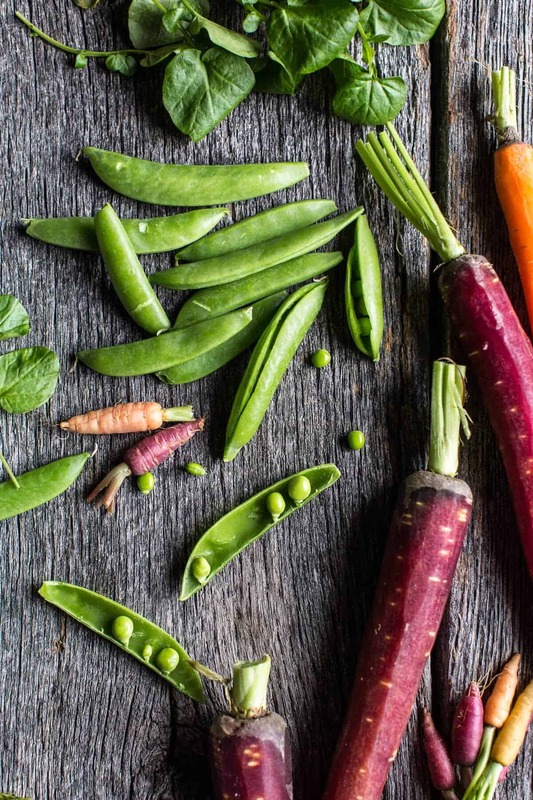 Meanwhile in a large salad bowl, toss together the carrot ribbons, snap peas, watercress or spinach, and fresh herbs. Add a couple tablespoons of the pesto sauce and toss once more, making sure to evenly coat the veggies. 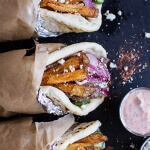 Add the toasted bread and sprinkle on the feta cheese. Serve with the remaining carrot top pesto. 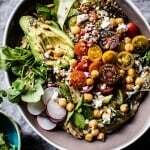 *This salad can be assembled up to 1 day in advance. Just add the watercress, herbs and toasted bread just before serving so they do not wilt/get soggy. You can choose to toss the salad with the pesto and let it sit in the fridge and marinate (which I think is delish) OR you can add the pesto just before serving. PS. Aren’t those baby carrots the cutest? If you can find them I highly recommend tossing them in with your salad, so fun! 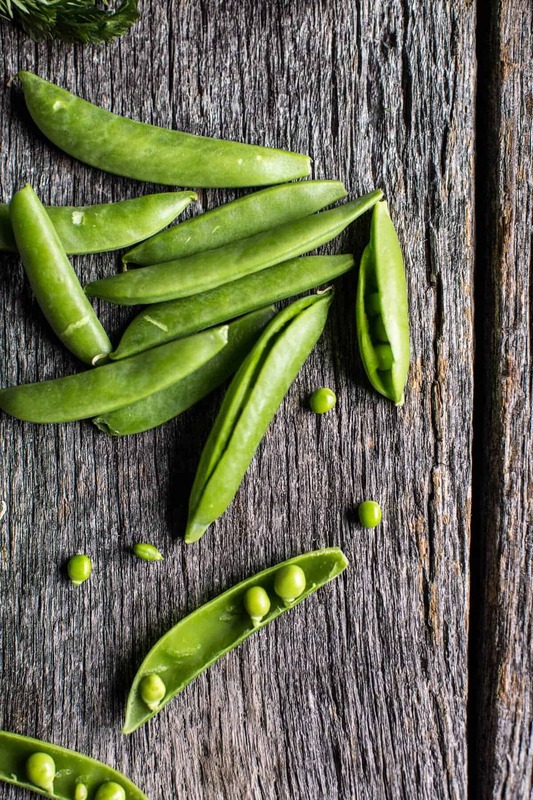 How photogenic are those peas?! And the color of those carrots, wow!! We couldn’t agree more, the only salad we will ever eat includes lots of cheese and carbs. Glad we’re on the same page! Omg, you’ve totally sold me and I love that you added the carrot greens to your pesto, it’s genius! You just made mr. Easter bunny very happy! THat carrot top pesto is looking beyond delicious!!! Such a bright and delicious sounding salad. I am obsessed with that pesto!! I’m sorry, all I read was Malley’s!!!!!!!! I could use some right now! Such a gorgeous dish for the Easter table Tieghan! Love that pesto! Have a wonderful Easter! 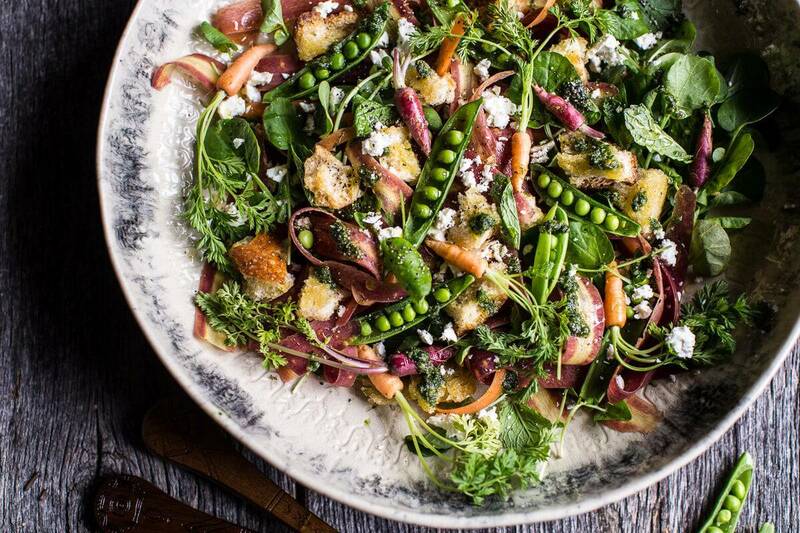 Incredibly gorgeous salad and perfect for spring/Easter!! Love the combo of ingredients here (especially love the pesto)!! I love using carrot top greens in my pesto! It felt kind of weird at first but I loved how it turned out. This is the perfect spring salad. Those baby carrots are THE CUTEST. Like, I’m thinking maybe I should plant extra carrots this spring just so I can harvest them when they’re itty bitty? 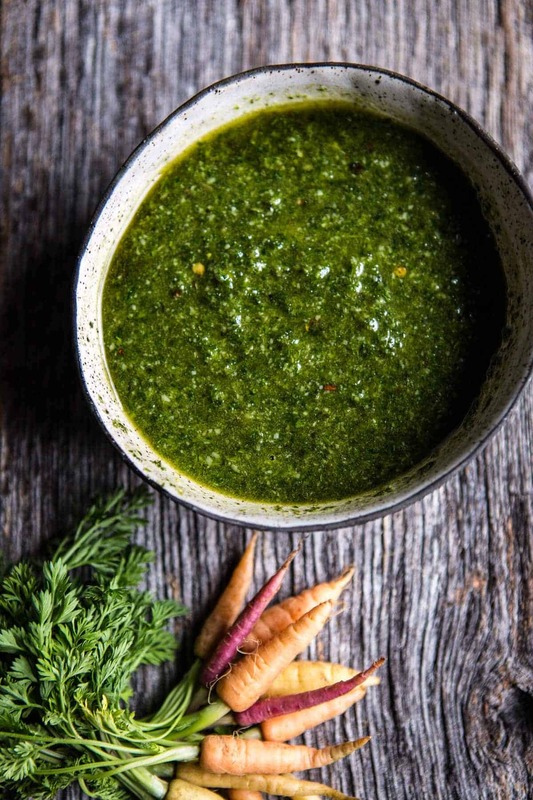 Carrot top pesto?! Enjoy your family celebration! I’ll be in DC (for the first time!!) visiting my cousin! Teeny weeny baby carrots! LOVE. This looks divine. Time to plant some carrots and peas! This is such a beautiful and creative salad. 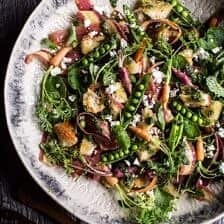 I am definitely making this salad for Easte dinner to along with Perfect Porterhouse Steak, a large baked potatoe, green beans. Dessert is being made by our daughter-in-law Megan…have a very Happy Easter sounds like you will be having a house full, as it should be, FAMILY! NO, the Easter bunny is REAL LOL XD I love the idea of creating a delicious pesto from carrot greens! Great way to not waste the food! This looks beautiful!!! You totally need to hug your produce guy! Not sure where you get it, but it is consistently the best produce I’ve seen. And I work in a Michelin Star kitchen. Beautiful. Where did you find those adorable little carrots?? I love them so much! This salad looks so amazing and fresh, plus just perfect with the feta and croutons. SO much flavor! 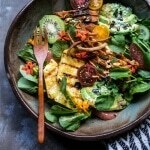 Tieghan, this has to be one of your most beautiful salads EVER!! I mean, all your salads are super pretty, but this one might just top the list. Seriously in awe, seriously. PS. you bring drinks and i’ll cook…someday soon! gorgeous, gorgeous fresh-looking salad! I wanna dive in, and I’m sure the Easter bunny does as well. I love using carrot tops as pesto – super innovative. 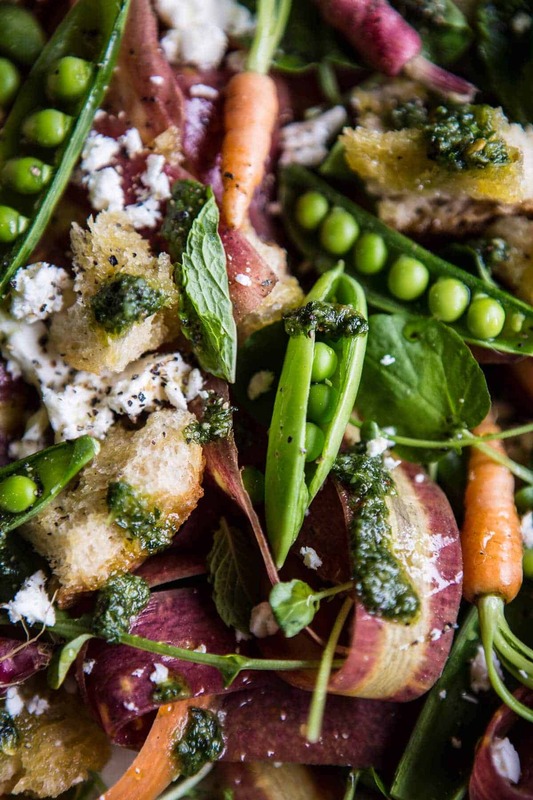 I love a spring salad with peas and that pesto is gorgeous! Those baby carrots are THE cutest things ever! This is the perfect Easter Sunday dish! Have the best Easter! THANKS! P.S. love the use of the carrot greens. I just used some myself in a dish and will ALWAYS be using them. Wow Tieghan, this salad is simply stunning. It evokes all the promise of spring on a plate. You’re inspiring me here! Thank you so much Steve!! (: means a lot!! These photos are gorgeous!! I reposted this article/recipe on my blog. I love EVERYTHING about this salad!! Thank you for posting! WOW!! Thank you so much Jill (: So so happy you like it!